When people think of nursing homes, often images from negative news reports come to mind. "This is unfortunate because according to industry studies many nursing homes do provide excellent care to their residents--and research proves it," says Joseph, a principal at Free Nursing Home Reports. The masterminds behind FreeNursingHomeReports.com, three healthcare professionals with backgrounds in long-term care, each felt that an easy-to-use public forum would help the elderly and their families make educated decisions when choosing a nursing home. Useful information about nursing homes already exists through government data sites. However, this information is very difficult to comprehend and often comes from subjective government employees. Additionally, non-government reporting agencies try to provide the same information via user-friendly reports, but they charge a fee for their reports. Free Nursing Home Reports wanted a website that would truly be useful. They had three distinct ideas to make this a reality: the site had to provide free information, it needed to incorporate government data in a format that was simple to follow, and--most importantly--it had to allow actual residents and their families to easily add their own opinions and reviews. 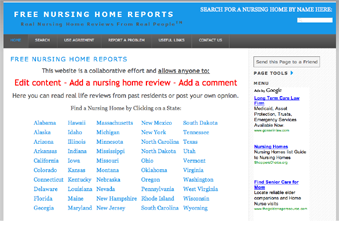 "While the site is populated with pre-existing nursing home profiles, the main focus of FreeNursingHomeReports.com is to encourage real people to write real reviews," says Joseph. He knew that reviewers would be discouraged if contributing to the site was the least bit difficult or counter-intuitive. Because EditMe technology allows any registered user to edit the details for each nursing home, the information is much more likely to be accurate and useful to the general public. "We were looking for the easiest, most user-friendly wiki software on the market. We wanted a one-stop shop, and EditMe was the obvious choice." "The staff at EditMe truly thinks outside the box. We told them our need, and they created a solution made just for our company." Create a free public forum about nursing homes throughout the United States. Encourage real reviews from real people by utilizing user-friendly wiki software. Incorporate existing data about nursing homes into the site in a reader-friendly format. EditMe's staff evaluated the company's needs and created a customized solution--just for FreeNursingHomeReports.com. EditMe's custom development team pre-populated the site with existing government data using an API. EditMe provided the most user-friendly wiki software so that users are encouraged to add their own reviews and pictures.